After withdrawing at half-time with a knee problem in Arsenal’s 1-1 Boxing Day draw at Brighton, Ozil hasn’t featured in the club’s past three games. 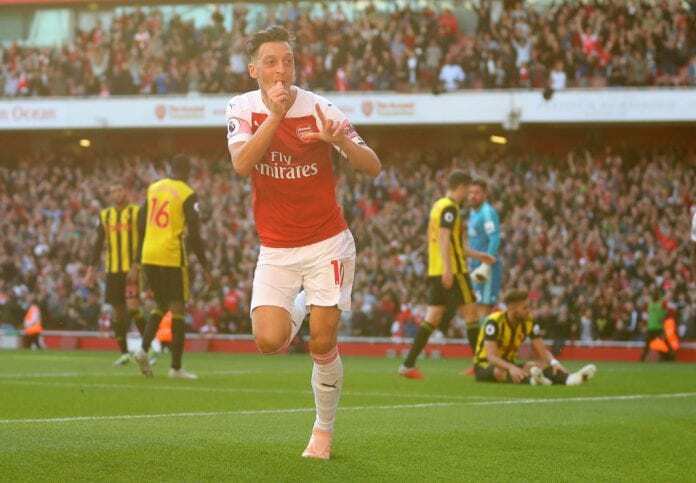 But Arsenal.com have confirmed that the German playmaker has made a return to full training, which could put Ozil in contention for this weekend’s Premier League match. Manager Unai Emery also welcomed back Spanish full-backs Hector Bellerin and Nacho Monreal to training, who were sidelined with calf and hamstring issues respectively. Captain and centre-back Laurent Koscielny, who was forced to withdraw in the warmup from last Saturday’s 3-0 FA Cup third-round win at Blackpool due to a back spasm, is also back. Fellow centre-backs Shkodran Mustafi (hamstring) and Dinos Mavropanos (groin) made a return to training themselves. Although Armenian midfielder Henrikh Mkhitaryan remains sidelined until February with a foot injury. English duo Rob Holding (knee) and Danny Welbeck (ankle) continue to remain absent while they recover from surgery.